Wednesday's police officer shooting happend near 12th and Dakota Streets in Milwaukee. A Milwaukee police officer sits near 12th and Dakota Streets, where Wednesday's shooting of an officer occurred. An officer of the Milwaukee Police Department was shot Wednesday on the city's south side. He later died at Froedtert Hospital. WUWM's Marti Mikkelson reports. The Milwaukee police officer that was shot and killed Wednesday has been identified as Matthew Rittner, according to a news release from the Milwaukee Police Department. Before joining MPD, Rittner was in the U.S. Marines. "Officer Rittner is a beloved member of our agency and has received a number of medals and awards," the MPD news release says. A Milwaukee police officer was shot and killed Wednesday morning on the south side. It's the third time in eight months that a Milwaukee police officer has been killed in the line of duty. The 35-year-old officer, whose name is not being released at this time, was a 17-year veteran of the department, Milwaukee Police Department Assistant Chief Michael Brunson Sr. said during a news conference. The officer was a member of the tactical enforcement unit. Brunson says the officer and other members of the unit were issuing a search warrant at a house near 12th and Dakota Streets on the south side. “At 9:20 am, officers made contact with two subjects at that location and shots were fired. One officer was struck. The officer was conveyed to Froedtert Hospital for treatment and he succumbed to his injuries,” Brunson said. 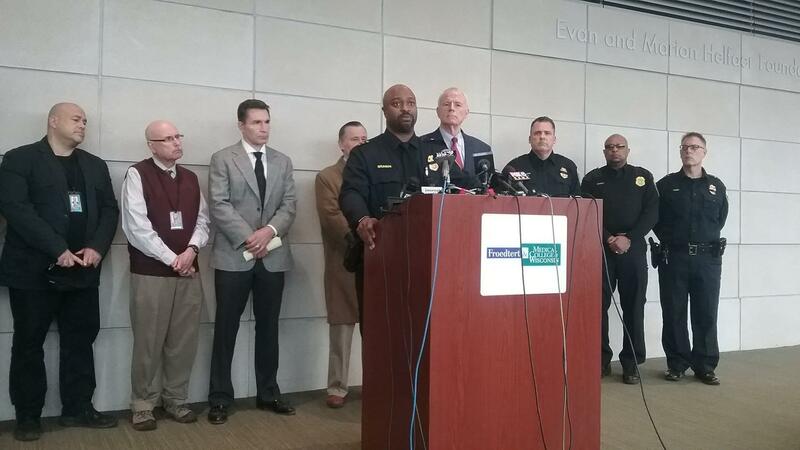 Milwaukee Police Department Assistant Chief Michael Brunson Sr. speaks during a Wednesday news conference. Brunson said this is a "tragic and impactful loss for our agency." The suspect, a 26-year-old man, was taken into custody not long after the incident. Milwaukee Mayor Tom Barrett says it’s a difficult time for the city. “I am filled with sorrow over this needless loss and at the same time I am filled with anger at the individual who took the life of this brave police officer. He was doing his job. He was working to make our city safer,” Barrett said. After the news conference, dozens of police cars formed a procession and escorted the officer’s body onto the freeway and to the Medical Examiner’s office in downtown Milwaukee. 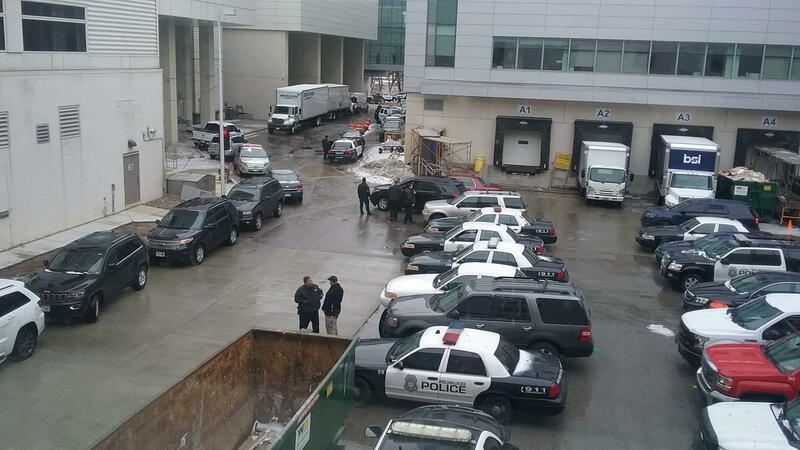 There was a heavy presence of police vehicles at Froedtert Hospital on Wednesday. In July 2018, Milwaukee police officer Michael Michalski was shot and killed while confronting a man. About two months earlier, officer Charles Irvine Jr. was killed after his squad car crashed while pursuing a reckless driver. "This is the third time in eight months that I've had to stand at a podium and talk about the loss of life of a police officer," Barrett said. "This is the third time in eight months that I've had to stand at a podium and talk about the loss of life of a police officer," Milwaukee Mayor Tom Barrett said. Ald. Bob Donovan, whose district covers the area where Wednesday’s shooting took place, appeared visibly shaken at the scene. He says it's a sad day for the city. “But I’m confident this department is resilient and will respond and continue to do the excellent job that they have over these many years,” Donovan said. Police departments throughout Wisconsin are offering words of support for MPD via social media. The Milwaukee police officer who was shot and killed Wednesday night has been identified as 52-year-old Michael Michalski. He was a husband, father of three, and a veteran of the department, said Milwaukee Police Chief Alfonso Morales at a press conference Thursday.